Reduce breakouts and clear up your skin..
Prátaí skin care products use the most NOURISHING parts of the Potato; which include the pulp, skin, starch and juice. The enzymes in raw potato pulp combined with its high Vitamin C content and NATURAL starch are a Potent Skin Food. 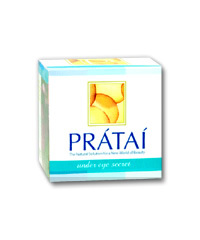 PRÁTAÍ™ Under-Eye Secret Instantly reduces puffiness, lines, creases and dark circles around the fragile eye area. Prátaí Under Eye Secret (30ml) A rich under-eye cream derived from the timeless, anti-inflammatory characteristics of Potato Pulp and Potato Starch. “Under-Eye Secret” also contains soothing Beeswax, Cocoa Butter, Soybean Oil, Collagen, Vitamin E, Grapefruit Seed Extract, Apricot Oil and various other natural plant extracts to instantly to reduce puffiness, lines, creases and dark circles around the fragile eye area.